This is the main picture display window showing a sample picture. Note the captions at the top of the picture window. There are actually three caption lines, each in its own assigned color. The top caption line is shown with an "embossed" 3D effect - the other lines are not. The third caption line is too long to fit, so it is automatically wrapped to the next line. But since only three lines fit in the caption window, the scroll bar appears on the right, allowing you to scroll down to see the remainder of the caption. The 4 buttons next to the timer in the lower left corner represent functions "First", "Previous", "Next", and "Last". Since we are at the first picture, the "First" and "Previous" buttons are disabled (grayed out). Same picture, but this time the caption overlays the picture, being placed at the top-center. The advantage is that you can see the full caption, and the picture is bigger, since we don't have to allocate space for a separate caption area. You can control the content of each caption line, and how it is shown (e.g., font, size, style, effect). The Thumbnails window is resizable. In this example, only part of the last row of thumbnails is shown, so the vertical scroll bar is visible. A red box around a Thumbnail indicates that it's picture is being shown in the picture window. You can select another picture to be shown by clicking on its thumbnail. If a thumbnail caption line is too long, it is truncated (indicated by a terminating vertical bar). The Thumbnails window is also used for re-ordering the pictures. This is the window you see if you click button Picture Tags. This particular tab shows the EXIF annotation text that can be placed within the picture. The white background of a text box indicates that the text can be changed. 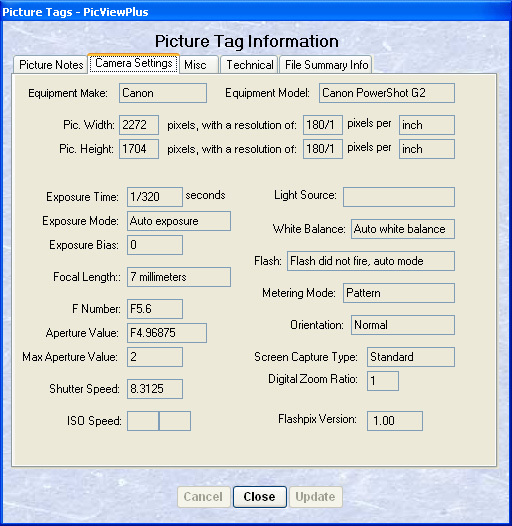 This is a view of the Camera Settings tab. It contains a full set of data since the picture was taken with a digital camera. These settings can't be changed. Here you see the Picture and Thumbnails Captions window, which is used to specify what information makes up the caption displayed on the picture. In this example, the user had clicked on tag Exposure Time and was just about to append it to the existing caption lines (by clicking on button ->). Note the text in the yellow box which contains helpful information about this tag. Notice that the list of caption lines is rendered exactly as you would see it on the picture. The Picture Appearance Preferences tab actually specifies the appearance of the area adjacent to the picture being displayed. In this example, you can see that the caption box (if used) will have an ivory colored background. Other parts of the picture window that don't contain the picture itself are painted with a Paper1 background. 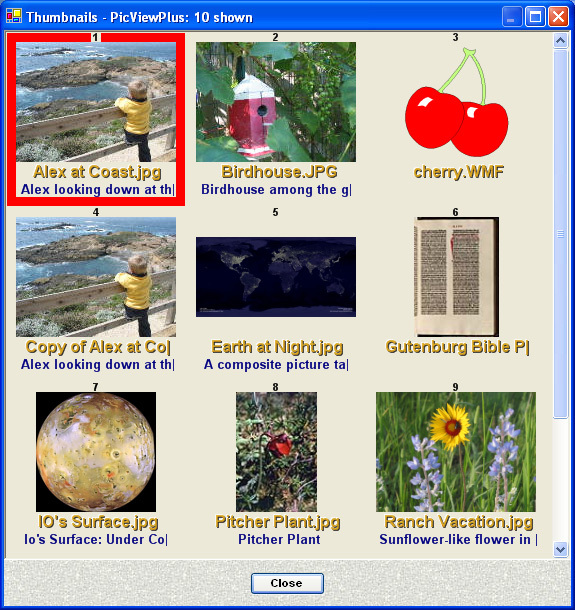 In this example, a picture frame called AFs010 has been selected to surround the picture. The picture frame molding bars are specified to take up 20% of the total picture height (molding bars plus picture height). 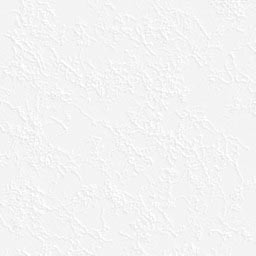 The thumbnail pictures are of medium (standard - 160x120 pixels) size. 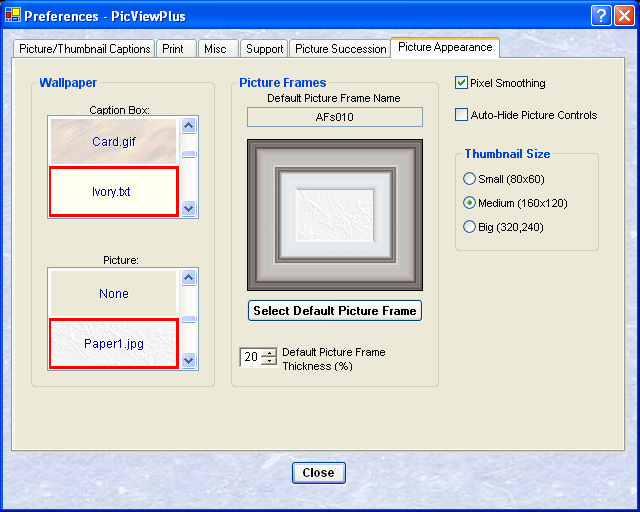 The Print Preferences tab is used when you want to make a hard copy of one or more of your pictures per page. In this example, the user has chosen to fill the letter-size page with four pictures, all of the same size. This example uses the same picture repeatedly, although each picture could have been different. 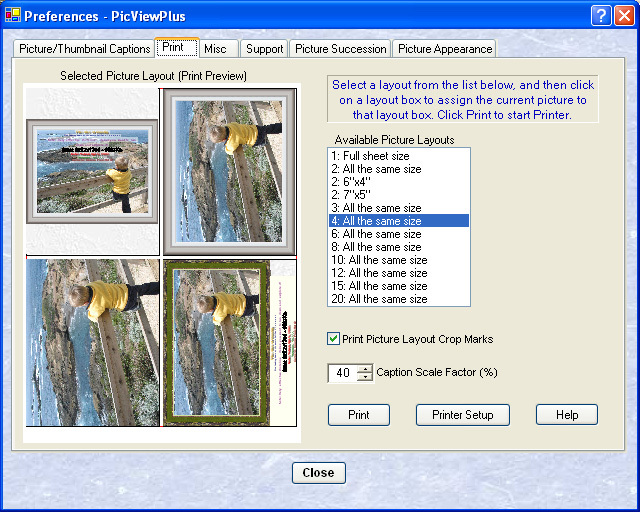 The upper-left picture was placed first by left-clicking the layout box. Since the caption turned out to be far too big, its entire size was scaled down to 40% of full size. Note the wasted space above and below the picture with this orientation. The upper-right picture was placed second, with a right-click on the layout box, causing it to be rotated 90 degrees CCW. 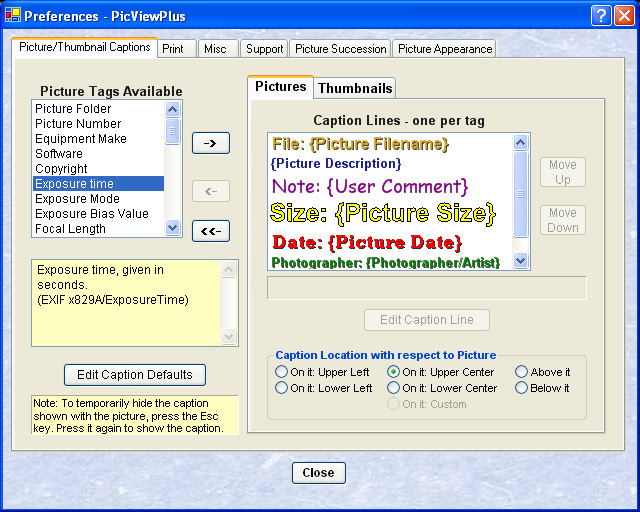 Using the Hide Caption option on the main picture window eliminated the caption display here. The lower-left picture was placed third, using no picture frame. Note that the orientation used, along with the lack of a picture frame, yields the largest unobscured picture. Finally, the lower-right picture was placed. 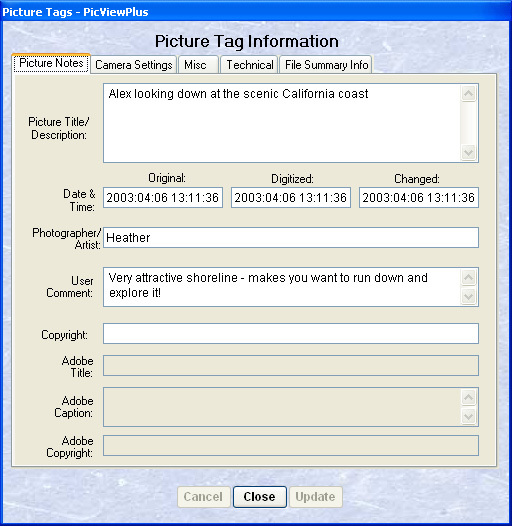 Before clicking on its layout box, however, a picture frame was first selected, and the caption was specified to appear below the picture. A right-click on this layout box then placed the current picture here at a 90 degree rotation. That completed the page composition, and clicking button Print resulted in the page being sent to the printer. If the print were to be of high quality, you could have clicked button Printer Setup to set the printer up for photo quality paper before clicking button Print.